Wild Woman's Wolf Pack is a blog created to help celebrate, inspire, and connect creative women everywhere - including artists, entrepreneurs, and any woman passionate about finding and living her life's purpose. Topics include breaking through your creative blocks, finding your voice, overcoming obstacles, and how to make a living by following your passion. 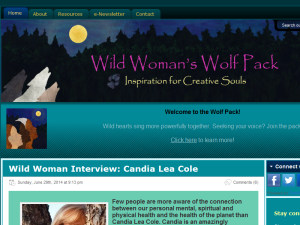 This what your Wild Woman's Wolf Pack Blog Ad will look like to visitors! Of course you will want to use keywords and ad targeting to get the most out of your ad campaign! So purchase an ad space today before there all gone! If you are the owner of Wild Woman's Wolf Pack, or someone who enjoys this blog why not upgrade it to a Featured Listing or Permanent Listing?